Get beyond the brand names and your countertop options really just come down to a handful of materials. The choices can seem overwhelming, but the truth is that there's never been a better time to be in the market for a new counter. Once upon a time, you were lucky to have some faded laminate as a small prep area beside the sink. Today, you can choose from hundreds of colors, patterns and textures, in materials ranging from natural stone and acrylic sheets to quartz composites and stained concrete. Here's a detailed look at the six most popular countertop materials: natural stone, solid surfaces, plastic laminate, ceramic tile, wood and concrete. The most common natural stones used to make countertops include granite, soapstone and slate. Here's a brief look at each material. Granite, once found only in expensive, high-end kitchens, is more commonplace today and is by far the most popular natural stone countertop material. Granite counters are sold primarily through local fabricators, but they're also available at many home centers and kitchen showrooms. The latest player in this market, DuPont (maker of Corian), sells granite countertops through its network of certified fabricators. Granite comes in a wide array of colors, ranging from vibrant blues and variegated browns, to midnight black, deep red and mottled white. It's cut into long, thick slabs that require few--if any--seams. Most fabricators routinely make one-piece granite counters up to 10 ft long. After cutting and polishing, the granite is treated with an impregnating sealer that makes the countertop stain resistant. This treatment usually lasts 10 to 15 years, but be sure to use a stone cleaner--not an abrasive cleanser--for everyday cleaning. The widespread popularity and availability of granite has stabilized prices somewhat, but it's not exactly cheap. Expect to pay between $75 to more than $250 per sq ft, depending on the granite color and complexity of the fabrication. Soapstone and slate both come in far fewer colors than granite. Soapstone is usually dark greenish-black, although lighter green-gray slabs are also common. Slate is an extremely dense stone that comes in five subtle colors: green, red, gray, purple and black. Slightly less common are variegated purple and mottled purple slates, which have visible veins and shades of contrasting colors. Both soapstone and slate can be fabricated into sinks to match the countertop. Soapstone is porous, and must be sealed with mineral oil to reduce staining. Slate, on the other hand, is nonporous and virtually maintenance free. Slate is relatively soft, but scratches can be buffed out with steel wool. Slate has a soft, matte sheen, but you can create a wet look by rubbing the slate with lemon oil. Slate countertops cost roughly $100 to $200 per sq ft, depending on the fabrication. Soapstone is priced comparably with midrange granite: $100 to $150 per sq ft.
Solid-surfacing materials--such as Corian, Wilsonart's Gibraltar and Avonite--are made of 100% acrylic, 100% polyester, or a combination of acrylic and poly. They're highly resistant to stains and scratchs, and completely renewable and repairable. Scratches and burns can be sanded out; deep gouges can be filled. Seams are fused together to create undetectable joints. And the material comes in literally hundreds of colors and patterns, many of which resemble natural stone. Solid-surface sinks are also available. Detractors dismiss solid-surfacing materials as being nothing more than imitation stone, which is a bit unfair. 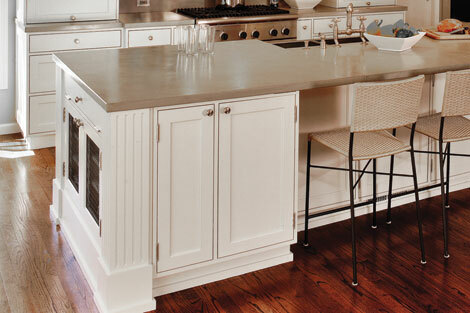 Solid-surface counters have been around for nearly 40 years and have performed admirably in thousands of kitchens. A unique characteristic of solid-surfacing material is that the design possibilities are virtually limitless. From intricate inlays and custom backsplashes, to elegant edge treatments and colorful pinstriping, if you can dream it there's a good chance the fabricator can create it. Consider quartz composite, a newer type of solid surfacing material. Also known as engineered stone, this unique material is composed of about 90% quartz and 10% acrylic or epoxy binder. DuPont's Zodiaq, Silestone,Cambria and CaesarStone are a few of the many quartz composites now available. The main differences between engineered stone and traditional solid surfacing materials are that engineered stone is much harder and has a depth, clarity and radiance not found in other solid surfaces. Quartz composites cost slightly more than traditional solid surfaces, but both materials are comparable to granite; expect to pay $150 to $200 per sq ft for a solid-surface counter. Plastic laminate--which is often referred to by the tradename Formica--is a durable, hard-wearing material that can survive many years in the toughest kitchens. Considering that plastic laminate is made primarily of kraft paper impregnated with resins, it's a surprisingly resilient choice. Plastic laminate is available in hundreds of colors and dozens of patterns, and in various textures. However, only those with a matte or fine matte finish should be used for countertops. Be aware, too, that there are two basic types of laminates: 1/16-in.-thick general-purpose, and 1/32-in. vertical grade. Only general-purpose laminate is suitable for countertops; vertical grade is for backsplashes, cabinet doors and drawer faces. Plastic laminate comes in sheets ranging from 2 x 4 ft to 4 x 8 ft. Longer, wider sheets can be special ordered. Prices range from about $2 to more than $3 per sq ft, depending on the laminate's color and pattern. Lumberyards and home centers sell ready-to-install post-formed laminate counters, which feature seamless construction. Again, prices vary widely, but a solid-color, 8-ft-long, post-formed countertop will cost between $80 and $100. If you hire a cabinetmaker to custom-build a counter, prices will range from $15 to more than $25 per sq ft, depending upon the laminate chosen, complexity of the edge treatment and size of the backsplash. The trend in kitchen design over the last decade or so has shifted toward low-maintenance, seamless counters. As a result, there are fewer countertops covered with ceramic tile. However, that doesn't mean you should totally discount tile for your kitchen. Tile is an excellent choice for backsplashes or for secondary work surfaces, such as islands, eat-at counters, peninsulas, wet bars or butler's pantries. Just be sure to use tiles rated for use on floors or countertops. "Never use wall tile on a counter. It's too thin and will easily crack," says tile contractor Jimmy Tiganella of Classic Tile in Oakville, Conn. Ceramic tile is often applied to a plywood substrate or directly over existing plastic laminate countertops. However, to ensure a rock-solid, long-lasting installation, Tiganella prefers using 3/4-in.-thick plywood topped with 1/2-in.-thick cement backerboard. It's difficult to estimate the cost of a tile countertop since much depends on the tile chosen and complexity of the installation. Simple solid-color tiles cost as little as $1 per sq ft, but the average cost is more in the $3 to $5 per sq ft range. A pro installation will cost between $30 and $50 per sq ft, plus the cost of the tile. Wood is another traditional countertop material that has lost prominence over the years due both to the widespread popularity of granite and solid surfaces, and to the mistaken perception that wood can harbor germs and bacteria. In fact, according to a 1993 University of Wisconsin study in which microbiologists intentionally contaminated wooden cutting boards during testing, 99.9 percent of the bacteria introduced died within 3 minutes of exposure to the wood's surface. The study found that wood cutting boards are safer, bacteria-wise, than plastic ones. Wood maintenance can be another issue, though: While polyurethane seals can protect a counter for a few years, many owners prefer to draw out the natural beauty and warmth of wood with a less glossy mineral oil finish. Maintaining an oiled surface, which requires reapplication every four to six weeks, is more of a commitment than most busy homeowners are willing to make. But, as with ceramic tile, there are secondary surfaces where using wood makes sense, such as a baker's prep area, a dining counter or a food chopping block. In fact, wood is the only countertop material recommended for cutting, slicing and chopping. Wood counters are typically made from rock maple--an extremely dense, blond hardwood--but teak, walnut, cherry and oak are also used. There are three ways that wood countertops are fabricated: edge grain, end grain and wide plank. Edge-grain counters are made of long, thick strips of wood that are glued together with the edge grain facing up. End-grain counters (butcherblocks) are constructed of relatively short, square sticks of wood that are joined together with the tough end grain facing up. These counters are usually 4 in. to 12 in. thick. Wide-plank counters are made by edge-gluing wide boards together. This is the most beautiful and traditional style of wood counter, but it's also the type that's most susceptible to cracking and warping, if it's not meticulously maintained. Wood counters are often finished with mineral oil or some sort of varnish, but Richard Brooks of Brooks Custom in Mount Kisco, N.Y., protects his wood counters with a long-lasting marine oil finish. Prefab slabs of edge-grain counters can be special-ordered at most lumberyards and are also sold through national wood dealers, such as Lumber Liquidators. The 1 1/2-in.-thick x 25-in.-wide counters are typically available in 8-ft and 12-ft lengths. Expect to pay about $200 for an 8-ft-long maple counter; the same size in cherry is nearly $250. End-grain and wide-plank counters must be custom made by a cabinetmaker that specializes in wood counters. Prices vary depending on the wood species used, but on average they're comparable with quality granite counters: $100 to $200 per sq ft. Concrete counters, which closely resemble slabs of natural stone, are becoming increasingly popular. Unlike the concrete counters of the late-1980s, which were poured messily atop the cabinets, today's fabricators offer precast counters that are made in a workshop and delivered--fully cured and finished--to the job site. There many advantages of precast counters, according to Gerry Santora of Chicago-based Soupcan: "Precast molded slabs are extremely flat and very smooth, as compared to hand-troweled finishes. And poured-in-place counters are notorious for curling up at the corners due to uneven curing." Poured concrete needs several weeks of curing time before it can be adequately sealed, which creates a huge inconvenience for homeowners. Precast concrete counters are typically 1 1/2 in. thick and available in slabs up to 10 ft long. A variety of colors can be achieved by adding pigments to the concrete during mixing. Once cured, the slabs are honed and sealed to prevent staining. Cracking is always a concern with concrete, and fabricators often use wire mesh, metal rebar or fiberglass fibers to strengthen the counter. Santora prefers to use a mixture of nylon and stainless steel fibers, which he claims produces 80 percent fewer cracks than counters reinforced with wire or rebar.A high-quality precast concrete counter costs from $85 to $100 per sq ft, which isn't outrageously expensive when you consider that each counter is custom made from scratch.